DC4 resides in a wild nest located at the top of a Tulip Poplar tree at the Agricultural Research Service's (ARS) U.S. National Arboretum (USNA) in Washington DC along with its sibling DC5 and Bald Eagle parents Mr. President & The First Lady. In Washington DC, the leg of 23-day-old Bald Eaglet "DC4" became lodged in the stick-rails of its nest, resulting in a human-coordinated rescue. During the evening of April 20th, the right leg of 23-day-old Bald Eaglet "DC4" became precariously lodged inside a hole within the outer rails of its large stick-nest. The eaglet was unable to free itself after many attempts to do so over a considerable period of time. Via the live-streaming cameras on dceaglecam.org, it became apparent to worldwide viewers that DC4 was in trouble and distressed, and that a human-coordinated rescue could significantly decrease the chance of serious injury to the eaglet's leg. The non-profit American Eagle Foundation (AEF) and the U.S. National Arboretum immediately cooperated with the U.S. Fish & Wildlife Service and Ex-Cel Tree Experts to plan the removal of the eaglet from the nest. "Typically when something goes awry in a wild eagle nest, we don't even know about it and nature simply takes its course," says AEF President Al Cecere. 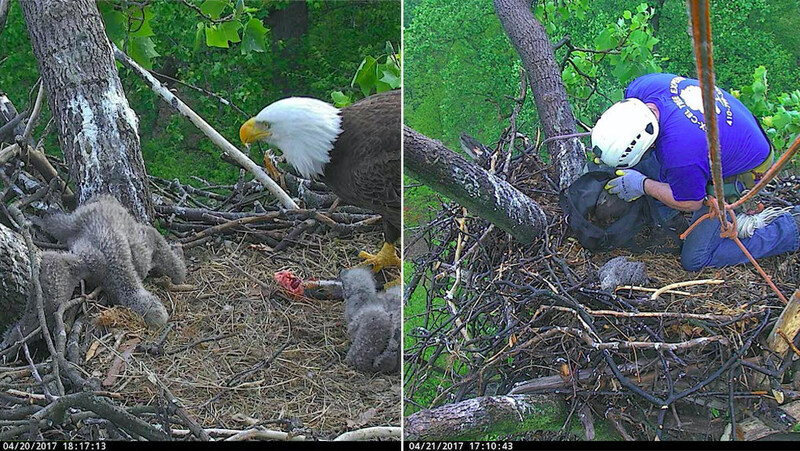 "In this case, however, we could all clearly see how much the eaglet was struggling and how human intervention might make the difference between life and death. We had the power in our hands to help, so that's what we did." After being retrieved and lowered from the tree by professional arborists Matt Morrison & Marty Levine, the eaglet was initially assessed on the ground by US Fish & Wildlife Service biologist Craig Koppie (also an experienced tree climber). It then received further examination by veterinarian Samantha Sander at the Maryland Zoo in Baltimore, who truly gave the eaglet the "presidential treatment!" A physical check-up and radiograph revealed no permanent damage to DC4's leg, with the only visible signs being a slight abrasion and swelling. Overall, the eaglet received an acceptable health report and was approved by the veterinarian to be placed back into its nest. DC4 was successfully returned to its nest at the Arboretum on April 21st at around 5pm EDT. Mr. President, The First Lady, and DC5 welcomed DC4 back home, safe and sound! The entire process of freeing the eaglet's lodged/stuck leg, getting it checked out/radiographed, and then returning it to the nest took less than 24 hours. Sue Greeley with USNA helped facilitate the entire process at the Arboretum, while AEF President Al Cecere guided and monitored the effort virtually by phone and internet from Tennessee. "We are extremely grateful for all USFWS, AEF, USNA, Ex-Cel, & Maryland Zoo staff and volunteers who readily responded to this emergency situation and helped make this a quick, safe and successful rescue effort," says Cecere.